Discover our state-of-the-art interior relaxation and recreation spaces. By becoming an Onze de la Gare condo owner, you will have access to the exceptional common areas, right at your doorstep. - A reception hall bordered by bay windows and its spacious terrace, with two industrial BBQs and numerous bistro tables, a communal room equipped with a complete kitchen and TV screen, dining area and two bathrooms. - An exercise room surrounded by full-length windows, with a variety of high-quality equipment. - Vast outdoor resting areas around a large in-ground, saltwater, heated pool. - Two outside lounging areas to unwind around a natural gas fireplace. 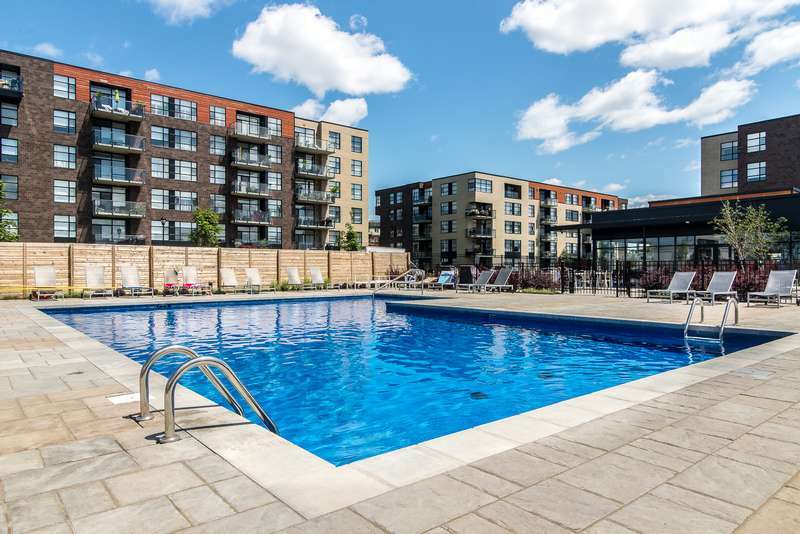 - Magnificent landscaping designed by well-known landscaping architecture firm Projet Paysage providing a variety of trees, shrubs and colors spread around the communal spaces and eleven buildings.